But it will be in February, so imagine overcast and drizzly. On a sort of whim, myself and three girlfriends booked a week-long trip to Ireland. Tourism is kind of down in mid-winter there, so we got the trip for wicked cheap. I just booked my travel to DC (to catch the flight across the big blue ocean), so now it feels really official. Of course early February is pretty much the busiest time of year at work, but the boss gave the okay on it, so I shouldn't feel too bad. And once I get there, I guarantee I won't have a second thought about work. It has been nearly a decade since my last trip overseas, so I am giddy about this adventure. 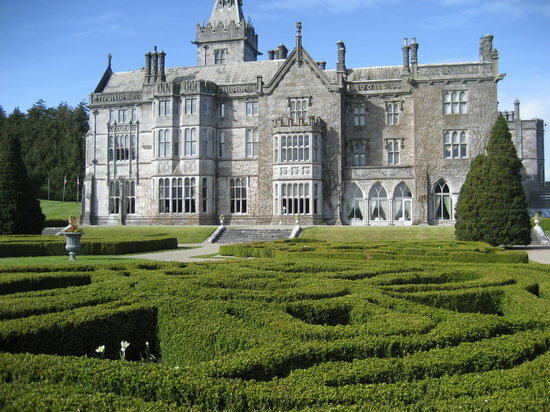 The above picture is of a manor house/castle, but we will be staying in the nearby villas owned by the manor house. It's just as well, since I think we have to be kind of dressy inside the manor. And I'm not so dressy. So now I am working out logistics for work, what and how to pack, and getting stuff ready at work so that I don't look like too much of a deserter for just taking off for a week. I have looked for any kind of 5K race that I could do while I'm there, but no such luck. I guess I will just have to do one of my own.